An astonishing Test match funnelled into a dramatic and decisive final session on Saturday, once again proving that Test Match cricket is the greatest format. Nathan Lyon drove Australia to victory by taking 7 wickets after India blew the chance to crush Australia. During the final day chaos Michael Clarke tore his hamstring and will have surgery. Steve Smith will captain Australia for the remainder of Border-Gavaskar Trophy. It was assumed Brad Haddin would takeover but progressive selectors have chosen the future. Smith is a great candidate. My concern is that his rise over the last 18 months may be hindered by the new responsibility. It may have been best to leave Smith’s surge into one of Australia’s brightest stars uninterrupted. But Clarke’s career is in the balance, and Smith’s place on the England tour in mid-2015 is more assured than the aging Haddin. As a batsman, Smith is now indispensable to Australia’s cause and he remained unbeaten in both innings against India. Big hundreds dominated the Adelaide Test, and aggressive clashes characterised day four. David Warner, Varun Aaron, Rohit Sharma and Steve Smith squared off in tense circumstances. With India pursuing wickets to create a chase, Aaron had been inexplicably ignored by his captain until the 31st over. He made an instant impact, ripping through Warner’s stumps and sending him off with a cheer. Warner was nearly back in the pavilion when he was recalled for a no-ball. The Indians were devastated, the crowd joyous and Warner chided Aaron. India’s self-appointed hard-man, Shikar Dharwan, got in Warner’s face and Shane Watson lumbered down the wicket, then everyone was tossing their handbags about. Warner went on to score his second-hundred of the match and by the time Smith was batting, India were frothing with frustration. On a long hot afternoon, with rowdy a Australian outer flowing on crispy cool amber and the game slipping from India’s grasp, Smith’s tactic of padding away Rohit Sharma’s off-breaks caused much grief. Sharma lodged several appeals for LBW, but Smith was getting three to four metres down the track and being struck outside off, rendering the shouts desperate. After one long appeal, Smith told Sharma to get on with it. Sharma was incredulous. He whirled around and raged at Smith. Kohli vehemently defended his bowler and once again the players converged to hurl handbags at one another. The contest was now exploding and the crowd loved it. A declaration was expected that afternoon; the thought of facing Johnson and Harris for 30 minutes in fading light, would not appeal to any opening pair. But Clarke clearly felt Australia didn’t have the runs. However, the late cameo by Mitchell Marsh (40 off 26 balls) convinced him to declare in the hotel that night. However unlikely, India’s task was not implausible. Considering the position they had manufactured by Tea, India will be bitter. Victory was a real possibility. Murali Vijay and Virat Kohli took them to 2/242, but they fell to pieces and Lyon finally did what Cricket Froth demanded was necessary to retain his spot long term; bowled Australia to a final day victory. Earlier on day five the hosts looked comfortable, particularly when Shikar Dharwan shouldered one to Haddin and was incorrectly given out caught. No DRS, no review. Pujarra got a genuine snick and Australia were circling, but Kohli and Vijay batted beautifully through five hours. After Tea the tourists needed 4 runs per over with 8 wickets remaining. A tired Australian attack emerged for one last push and their patient adherence to the plan prevailed. Lyon struck Vijay in front for 99, and when Ajinkya Rahane was incorrectly given out caught at bat pad, an epic collapse was on the cards. The new Adelaide Oval hospitality areas are world class and thousands of patrons spend hours wining and dining in them at the back of the stands. The city skyline provides a striking vista. But as soon as the fourth wicket fell, those thousands abandoned the bubbles and canapés and re-joined the rest of the crowd to urge Australia forward. India were emboldened by Kohli’s resistance, but poor shot selection failed him and India’s hopes unravelled. The long tail rolled over in quick succession, succumbing by 48 runs. 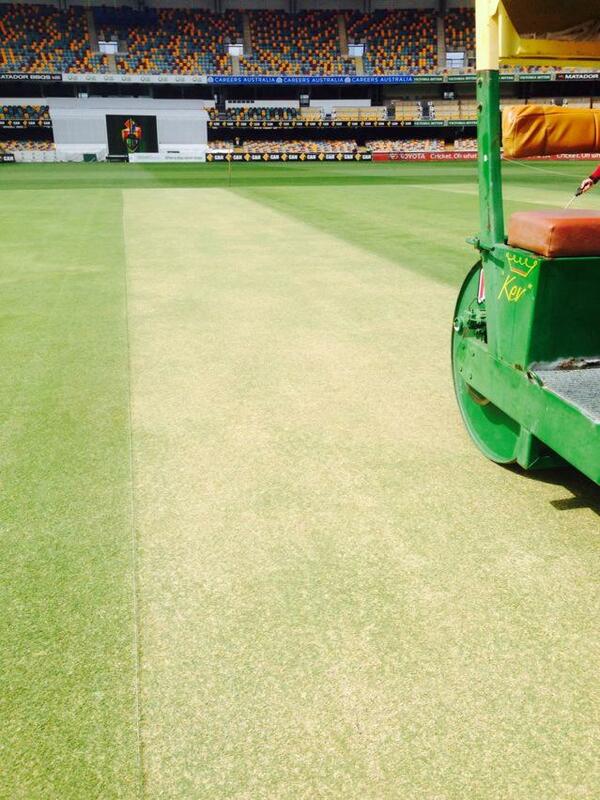 The Second Test begins on Wednesday at the GABBA. Surely it gets even tougher for India there? Hot storms have battered Brisbane for weeks and the GABBA wicket should be a juicy green top, suiting the cut and thrust of Ryan Harris and Mitchell Johnson’s terrifying wrath. Big quick Josh Hazlewood will probably be unleashed at the expense of Siddle. Shaun Marsh will replace Clarke. India have their own weapons; some very fine batsmen in Pujarra, Vijay, Kohli and Rohit Sharma and a potentially underrated Varun Aaron who may also enjoy the GABBA pitch. Another great Test is on the horizon on this GABBA green top.